We’re over half way through ‘Spooky’ Month, and I’m still going strong with the 31 Days of Horror. I started a new job last week at the Ministry of Defence, so my Geek Time has taken a rather large hit as of late. That said, here’s what we’ve been up to the last week. So as mentioned at the start of October, I decided to attempt watching some form of horror film every night in October. There have been occasions where I’ve unfortunately not been able to watch a film a night, but have made up for it by watching 2 the next time. At the time of typing this I’m up to date with 15 films in 15 days. I had tried for the most part to watch films I’d not seen before. I’ve mainly stuck to this but have had to raid a few old films I’d seen to keep the numbers up. The majority of the first time views have been pretty positive. Of the 15 films watched so far, 4 of those I have previously seen (Friday 13th (Original), The Amityville Horror, The Haunting & The Cabin in the Woods). One of my first time viewing films was the well received and highly praised “The Descent”. I’d heard that this was meant to be one of the scarier films I might watch throughout October. I have to say though, that while the film is pretty good yes, It’s definitely not within the top 5 scariest film I’ve watched so far. The Conjuring has been a genuine surprise film for me. It was a lot better than anticipated and definitely one of the scarier films, Unfortunately the sequel wasn’t quite as good, but still very entertaining and did have some suspenseful moments. While sticking with the ‘Conjuring cinematic universe’, I also watched both Annabelle and Annabelle: Creation. Creation was right up there in terms of intense moments, but the first one didn’t quite live up to expectations that had been set by the Conjuring films. Rather than talk further about each film individually (as that could get boring), I’ll end off with 2 more. Firstly the most recent remake of Evil Dead. It’s not as a scary as the Conjuring, but just so damn entertaining. And lastly the recent remake of IT. I watched this while home alone for the weekend, and despite watching a few other paranormal style films while home alone, for some reason this film really did play tricks on my mind when eventually in bed. I normally sleep with the bedroom door shut, but on this night, had my 2 cats in the bedroom for company. Perhaps a mistake in that I needed to keep the door open for them, and each time i’d turn over to face the side of the room where the door was, I was bracing myself to see Pennywise just at the bottom corner of the door frame. Seriously find it strange this film stuck with me more than the others I’d seen. I got invited to participate in the closed Alpha for SOS which ran over the weekend. SOS is set up like an interactive gameshow where you and 15 other contestants are dropped on to an island and have to try and escape. In order to escape you’ll need to find a relic, signal for extraction using a flare gun and get on the chopper. Only 3 survivors can fit on the chopper and you have 30 minutes to complete all of this. Oh, and there are these weird monsters that attack you too. The setup for SOS is very unique it’s done in a game show style where all the contestants are shown and you get a quick chance to say a few words over the mic – maybe to try and persuade someone to buddy up with you. The speech is all synced up to the character so there mouth moves when you talk, honestly it was pretty damn funny seeing people pretend to be all these characters and just messing around. I’ll be honest, for the most part I didn’t really know what I was doing or what was going on when I first stared playing. There is some sort of ‘buddy’ system where you can group up. You have a radio in game where you can tune in to channels and talk with people – presumably to make plans. To me it actually seems like a pretty unique idea. I spent most of my time picking up random things and seeing what I could do with them and beating up those weird monsters. I didn’t even get close to any kind of extraction. I actually think the game looks pretty promising though and I’m looking forward to when they do some more testing so I can get stuck in a bit more. 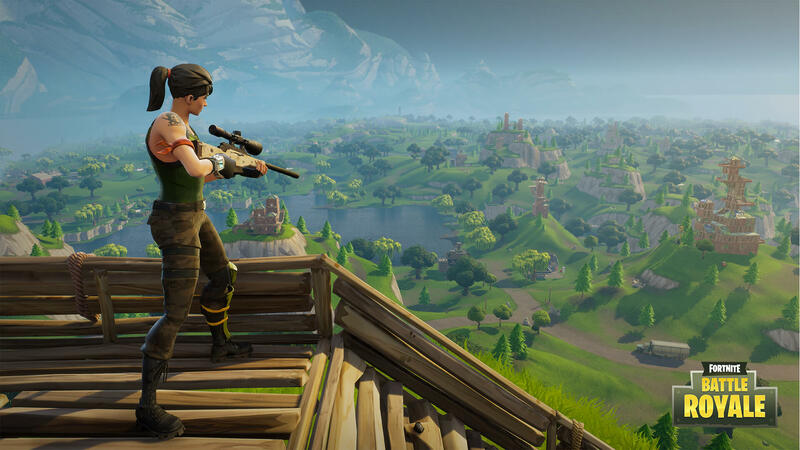 I’m sure a lot of you are aware that Fortnite released a Battle Royale mode a little while back. Well being a lover of the BR game mode I wanted to check it out as I was hearing and seeing a lot of good things about it. I have to say that I actually quite like it for the most part. It feels a lot more casual than say PUBG and, well, basically a bit silly. You can still build in the BR mode which makes things pretty interesting as you can just build a base way up in the sky if you want to, it’s a risky move, but still something you can do. One thing that I don’t like about it is the RNG of shooting, there doesn’t seem to be any predictable recoil on guns which means gun fights can end up being a bit random. If you line up a headshot there’s no guarantee that it will hit – unless it’s a sniper rifle, but I’ve had shots with AR’s that just wiff passed their heads even if I’m stood still and perfectly lined up. It’s annoying and makes engaging in gunfights at a distance a little pointless. But overall I think it’s pretty good fun and I will be playing some more of it I’m sure, although I don’t see it replacing PUBG as that is still the ultimate BR for me!